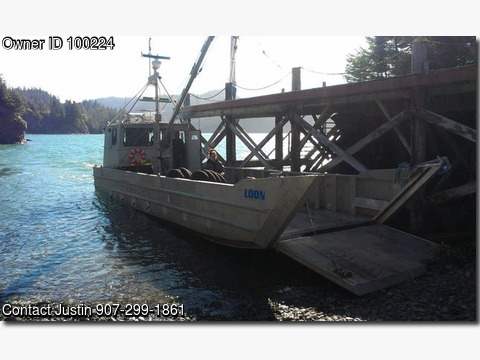 Please call owner Justin at 907-299-1861.Boat Location: Homer, Alaska. 23,000lb payload, 8.5 knots with full load, 9.5 knot empty. Dimensions 42'long 12'wide 30' lineal flat deck Deck width 10ft 10' wide bow ramp 5' long 20' long aluminum boom 1500lb lift capacity . Hydraulic winch with spectra line. ENGINE MECHANICAL - Twin Cummins 6BT5 9M 210 hp diesels - Rebuilt 2013 - Keel cooled. Velvet Drive 10-06-005 marine gears Stern Power Systems Series 1000 outdrives. 1-station Hynautic steering Morse cable controls Cessna belt driven hydraulic pump w/20 gallon tank 2 Rule 2000 12 volt bilge pumps Jabsco 12 volt fresh water pump. TANKS- 88 gallon fuel capacity in 2 aluminum tanks 40 gallons fresh water tank. ELECTRONICS- Full instrument panel All new wiring through-out 2 Cobra Marine DSC VHF Global Star 940C radar - 24 mile 2 Garmin Echo 200 LCD sounder 3 8-D 12 volt batteries 3 LED light bars located on mass. SAFETY - 4 Life jackets 2 Survival suits Viking 4-person life raft 2 2-12 lb dry chemical extinguishers. Cabin- 12'x12' sleeps 2 Folds down to bench seat Captain's chair, Passenger seat 2 Doors- to bow and stern - both lock Fully enclosed Sink and cabinet Propane Cabin Heater.